He arrives in the town of Semipalatinsk by steamer (coming up the Irtish river from Omsk) on June 7th,1913, and then he and his servant John Periera prepare for this overland journey by buying a tarantass, a type of 4-wheeled cart. Although in the post road system one would typically receive a new horse and tarantass at each post station (about 20 to 30 versts apart — a verst being 1067 metres or slightly longer than a kilometre), Howard-Bury has strategized that by providing his own tarantass he’ll avoid repacking the heaviest boxes at each change of horses. They depart Semipalatinsk on June 9th in the late afternoon. The first three days of post-road travel takes them to the town of Sergiopol, covering on those days, by his reckoning, 47, 101 and 124 versts respectively (53, 108 and 132 km). Mountains of Heaven does not give us a detailed map, but it’s not hard to determine the route to Sergiopol, which is an old name for the town of Ayagoz, Kazakhstan. By following the most direct road between the two towns on Soviet maps made in the 1980s, I can get just these distances that Howard-Bury reports. After Sergiopol, things get a bit trickier. Howard-Bury and Pereira stop sleeping at post stations and the author takes to giving distances from one midnight to the following midnight. At the end of day 6, they are one stage beyond the town of “Kapal,” which it’s easy to be confident is the still-extant town of Kapal, Kazakhstan. But by which route did they get from Sergiopol to Kapal? Howard-Bury mentions all sorts of landmarks over these three days, which we can try to match up with the terrain. He gives the travel distances as 140, 153, and 105 versts, respectively (150, 163, 112 km). The most crucial landmark is a town named “Lepzinsk,” which they pass through towards the end of Day 5. If we can locate this Lepzinsk, we’ll be close to drawing the right post-road connection from Sergiopol to Kapal. Here are the clues which Howard-Bury gives us. Towards evening we got into flatter country again, where the plains were covered with wormwood as far as the eye could see. We are now not far from the shores of Lake Balkhash… there is good fishing to be got at this end of the lake where the Sergiopol River flows into it. The going was very sandy and heavy. We kept crawling slowly up and down over big sand dunes, when all of a sudden in the midst of the sand, we came across a fair sized river on the far side of which, across a wooden bridge, stood the town of Lepzinsk, set in a bower of green. What a delightful contrast!… There were pleasant grassy meadows all around, well irrigated and with many a wild flower growing on them. The contrast to the barren country through which we had been passing made Lepzinsk look doubly beautiful. …From now on to the mountains, the rainfall is greater and the climate milder, so that vegetation becomes everywhere more luxuriant. On arrival at the top of the pass, which was only about 4,000 feet in height, there was a glorious view of the snowy mountains, only separated from us by a narrow grassy valley. Soon after mid-day we arrived at Kapal… Except for a few trees at Sergiopol and Lepzinsk, this is the first place in the 650 versts that we have traversed since leaving Semipalatinsk, where they are at all plentiful. So there are some wonderful clues here: the arms of a sandy desert coming in from the west, the proximity of Lake Balkhash, verdant Lepzinsk in the midst of sandy dunes and first seen on the far side of a “fair sized river,” a pass at 4,000 feet in a range of rocky hills “that formed a kind of buttress to the snowy Ala-tau mountains,” and a plateau over 4,000 feet that leads on to Kapal. To make initial sense of all this, let’s take a look at this map. This is a portion of a Soviet topographic map at 1:1 million produced in 1973. 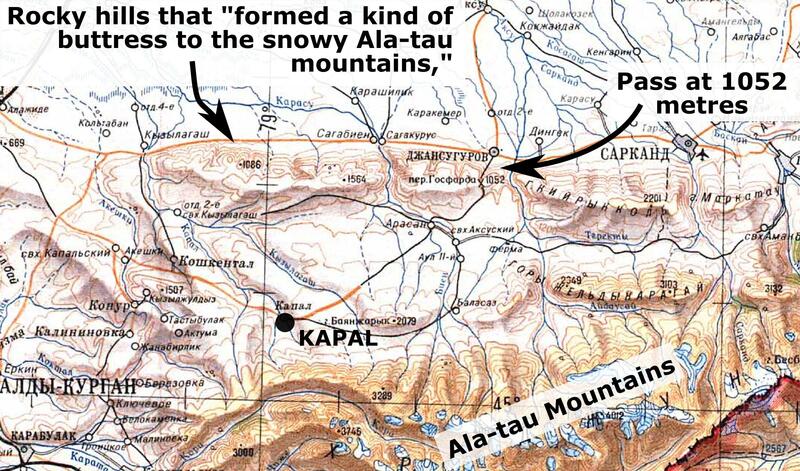 As you can see, Kapal lies near the large northeast-trending mountain range at the bottom of the map, the Dzhungarskiy Ala-tau, which Howard-Bury calls the Ala-tau mountains. Starting from the end and working backwards, Let’s look at the area around Kapal for a traveller arriving from the north. This topography seems to correspond well with what Howard-Bury describes on Day 6. 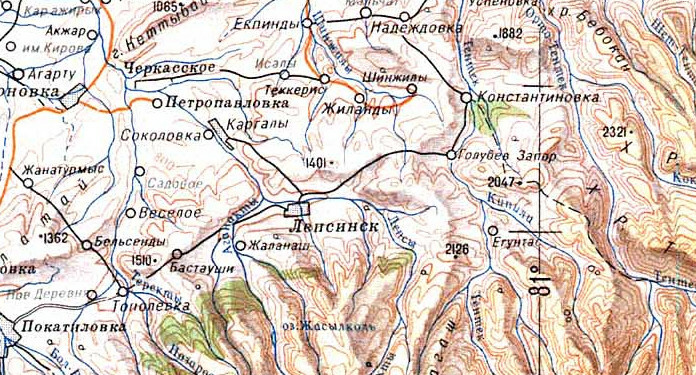 There’s a line of rocky hills forming “a kind of buttress to the snowy Ala-atu mountains,” and there a pass through them marked, on this Soviet map, with an elevation of 1052 metres, or 3500 feet. From the pass to Kapal the route continues to gently ascend. The town at the foot of that 1052 m pass was marked as Джансугуров/Dzhansugurov in Russian. Now it is Жансугиров/Zhansugirov, Kazakhstan. We have reduced our task to determining the route from Sergiopol to Zhansugirov. Let’s back up for a moment and look at rivers in the area. There are three main rivers that feed Lake Balkash in this area. From north to south today they are called the Ayaguz (Аягуз), Lepsi (Лепсы) and Aksu (Аксу). 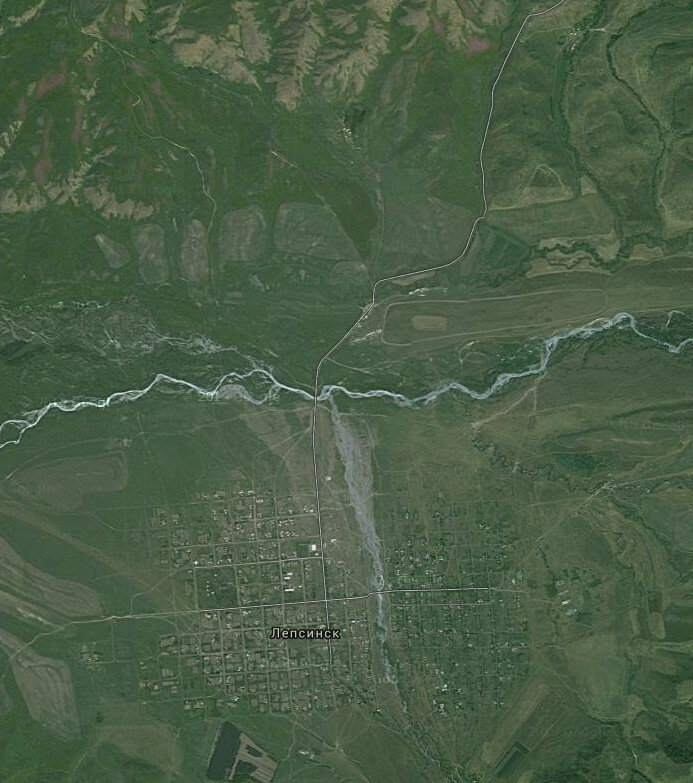 These are three of the famous Seven Rivers that give the region its name in Kazakh (Jetyysu) and Russian (Semirechinsk). Howard-Bury mentions following the Aksu as he leaves Sergiopol, but confusingly the Aksu is the southernmost of the three rivers we see here. It’s possible that after staying up all night for so many days became confused about which river he saw on which day. But it’s also possible that someone told him the Ayaguz was called “Aksu,” because Aksu is a very common name for rivers in Central Asia (meaning, essentially, white water or clear water). 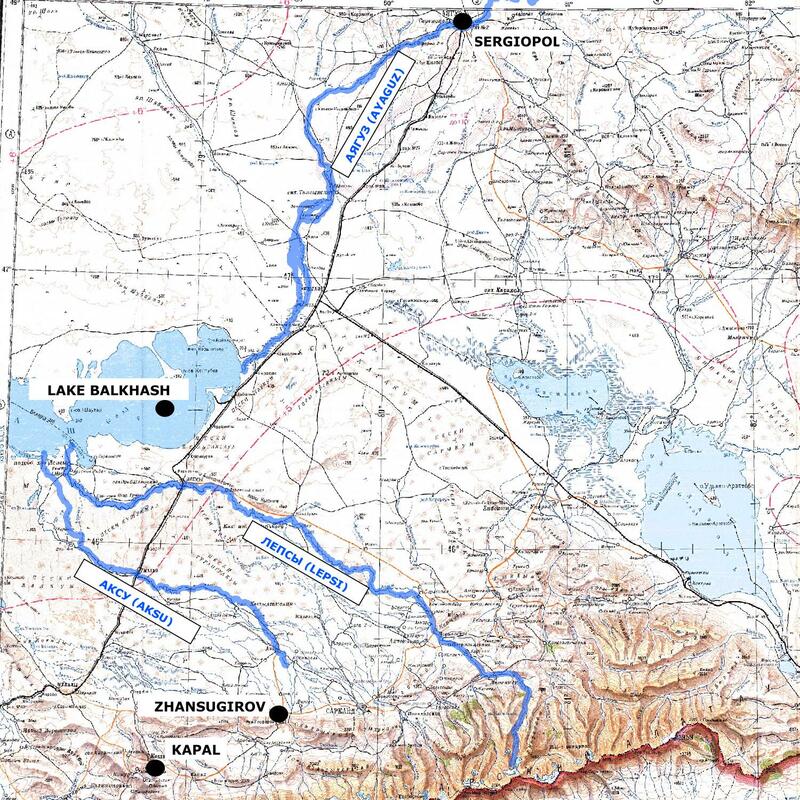 He also refers to a Sergiopol river, which, from his reference to it entering Lake Balkhash we can assume is the Ayaguz. We might expect a town called Lepzinsk to be on the Lepsi river, since “Lepzinsk” is essentially a Russian construction meaning “of or pertaining to Lepsi.” Surprisingly, there are three candidates for this town, and, correspondingly, three main route choices. This route is initially appealing because it mimics the railway corridor shown on the 1973 map. It passes close to Lake Balkhash. But, there are a few problems. 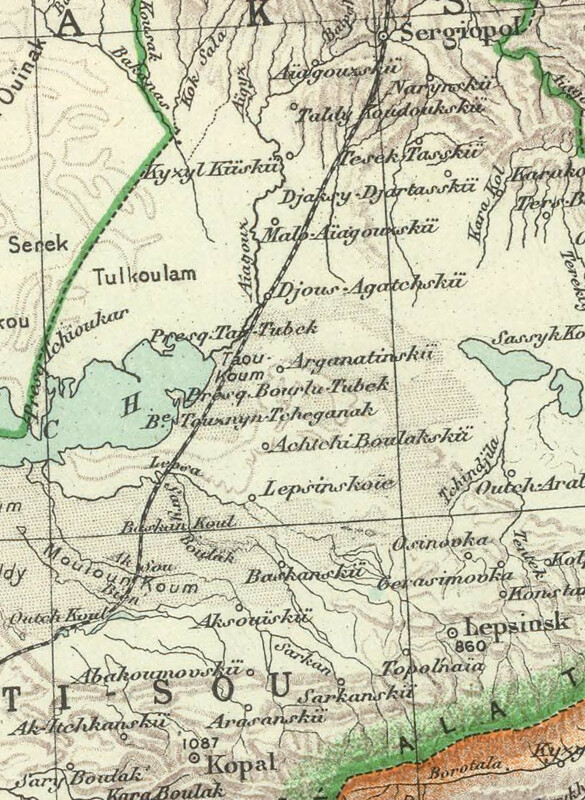 The town of Lepsy is on the north side of the river, and Howard-Bury says that he sees the river “on the far side of which, across a wooden bridge, stood the town of Lepzinsk” As well, prior to getting close to Lake Balkhash, arms of desert crossing this route would come from the east. There are a number of problems with this route as well. Overall the eastern route is too long to match the distances Howard-Bury gives. 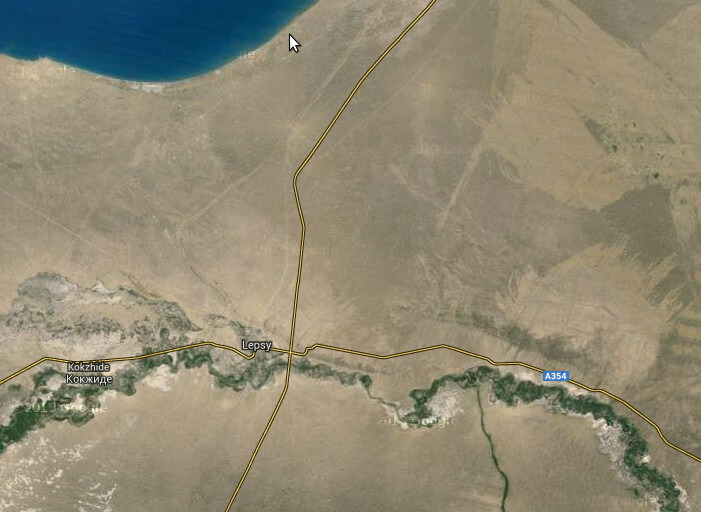 It goes nowhere near Lake Balkhash. A satellite picture indicates that rather than travelling “up and down over big sand dunes” before coming upon the Lepsi river in this area, one is in a well-vegetated region. Notice he actually has two Lepzinsks. 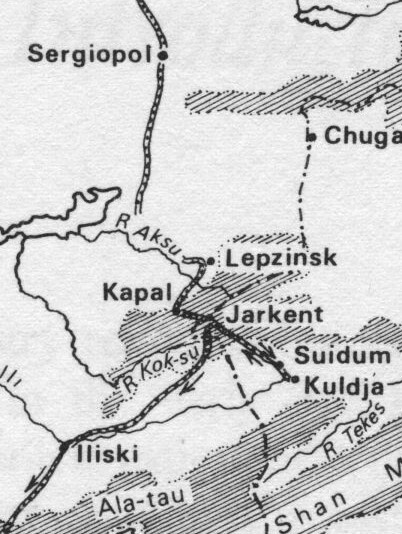 There is Mid Lepzinsk, labelled ‘Lepsinski,” and also High Lepzinsk, here labelled ‘Lepsinskaia (Lepsa).” Also, importantly, he shows the post road from Sergiopol to Kopal running through Mid Lepzinsk. Again we have the two Lepsinsks, and the same post road passing through Mid Lepzinsk. It’s also probably worth looking at the map that comes with Mountains of Heaven. Lepzinsk is there, but it is hard to say from this map whether Mid or High Lepzinsk is intended. Looking at other maps we can see that a bearing from Kapal to Mid Lepzinsk is more north than east, whereas one to High Lepzinsk is more east than north. 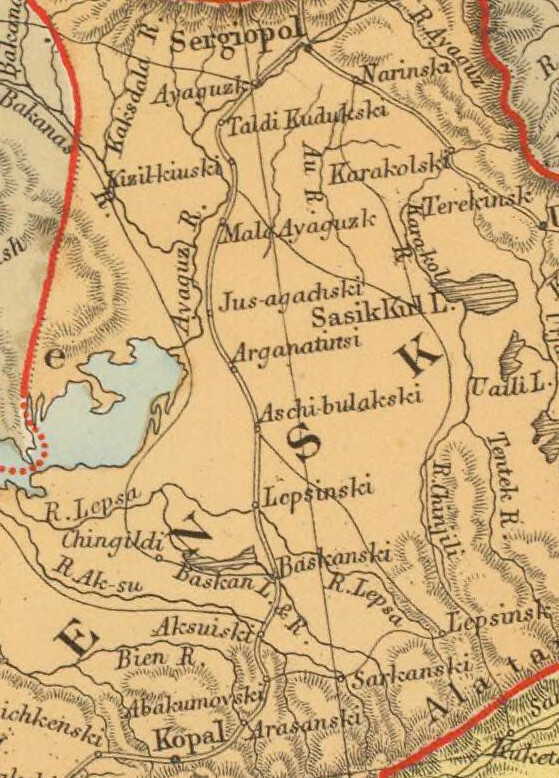 Without longitude lines on this map we’re making a guess, but the Lepzinsk shown seems to be north-northeast of Kopal, and therefore would be Mid Lepzinsk. 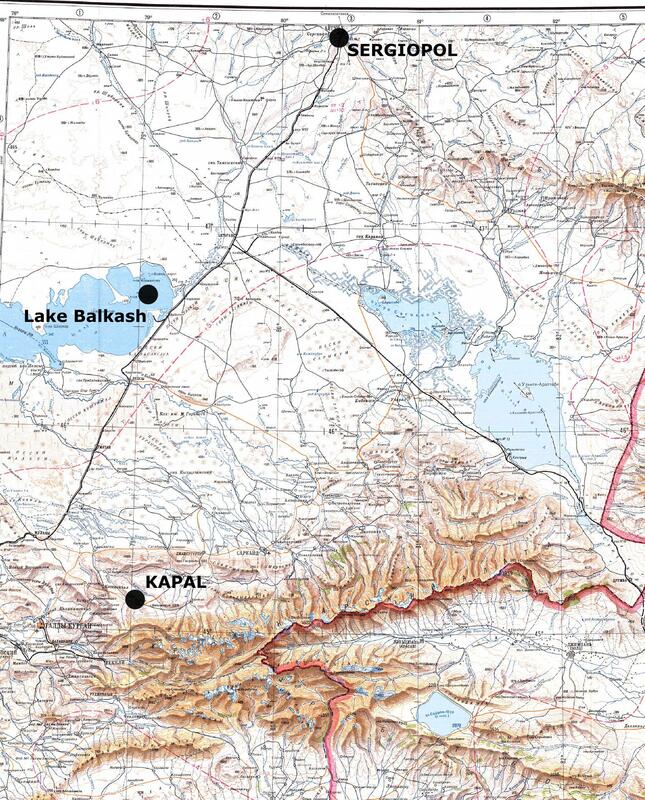 What’s confusing is that the only river shown is the Aksu, which we know to be south of the Lepsi, and in fact the author’s route is shown as going to Lake Balkhash and then up the Aksu to Lepsinsk. This seems an unlikely route choice, as if one actually went up the Aksu he would have to turn north to get to a town on the Lepsi. An argument against Mid Lepzinsk is that it no longer exists by that name. 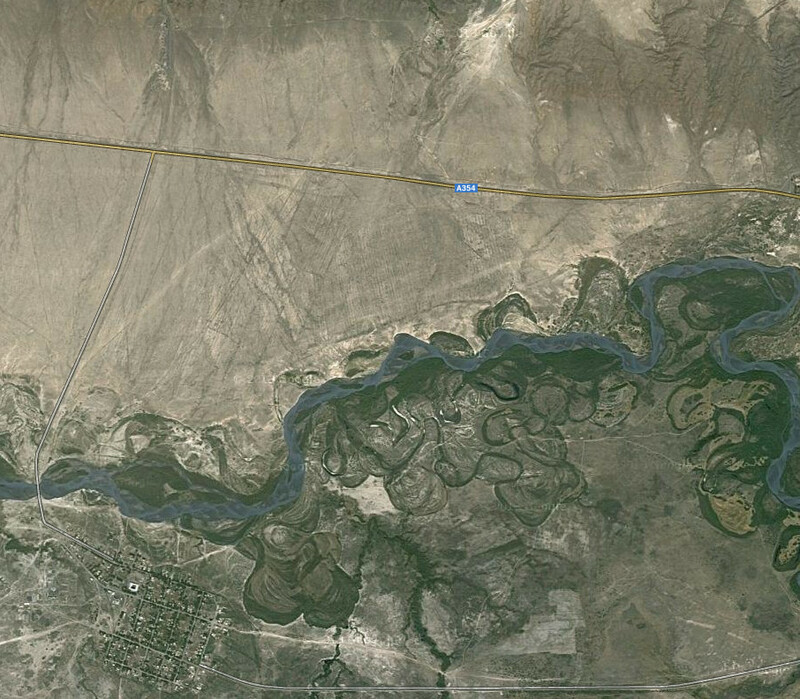 At this site today there is a town and a crossing of the Lepsi (and it is suitably situated with sandy areas north of the river, as the satellite image below shows) but it is called Kokterek (or “Blue Tree”), Kazakhstan. I can’t find any evidence it was ever named Lepzinsk. 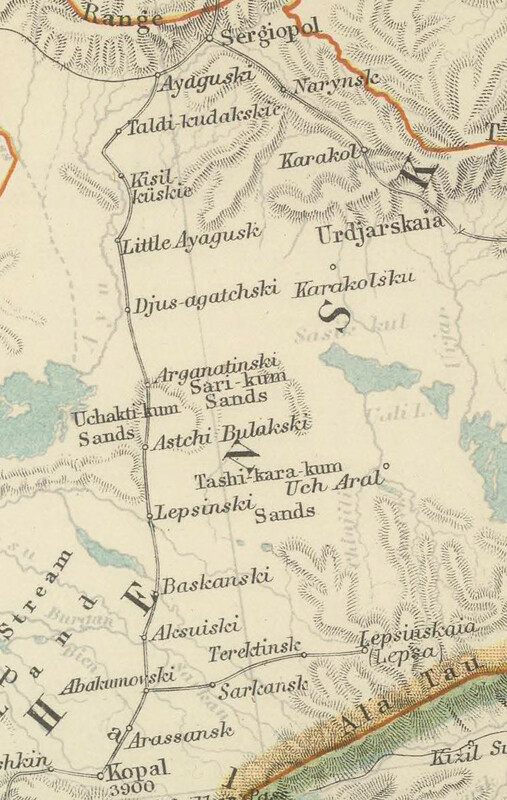 Modern day Kokterek, Kazakhstan — formerly known as Lepzinsk? In favour of Mid Lepzinsk and the Central Route option is that on this route it is easy to make distances agree with the daily distances Howard-Bury gives. 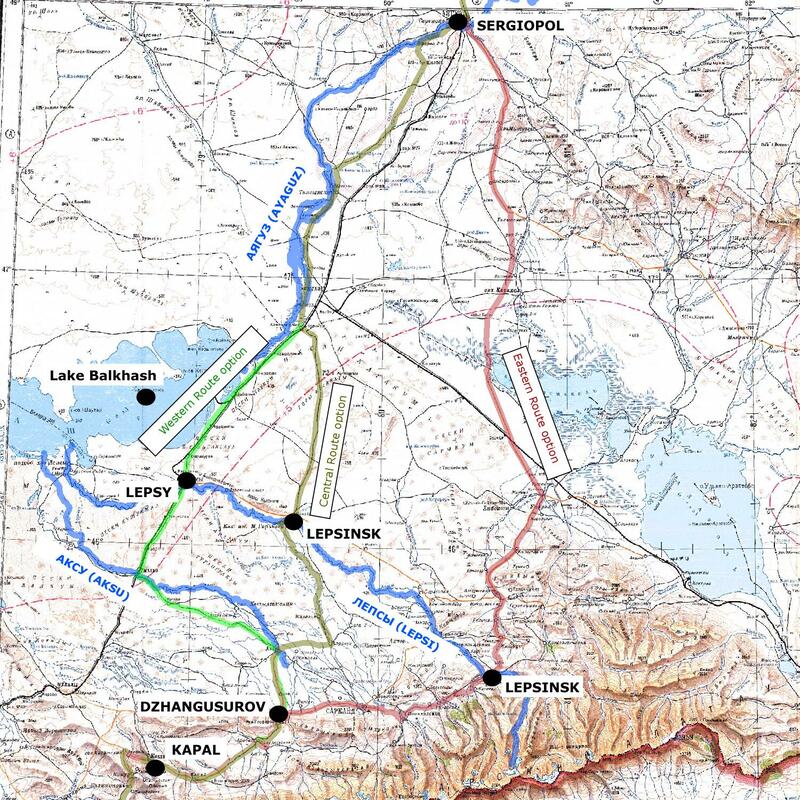 So I vote that Howard-Bury’s Lepzinsk was the town today known as Kokterek, Kazakhstan, and that he took what I have shown above as the central route from Sergiopol to Kapal. 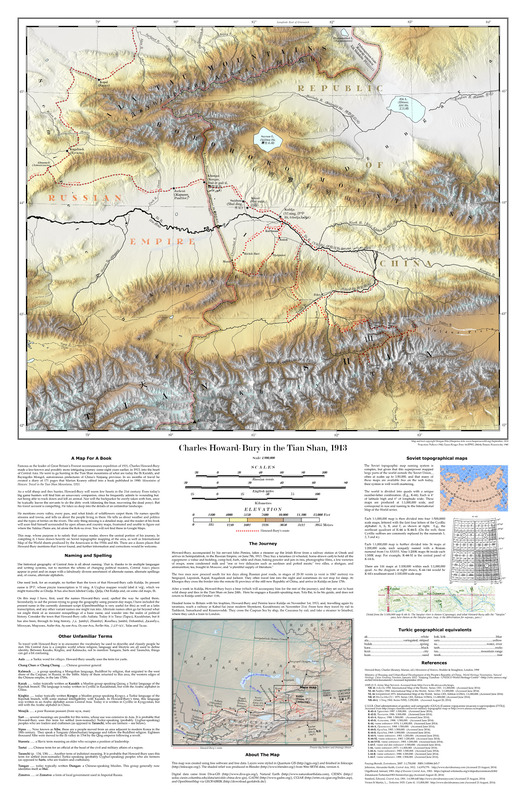 I’ve just finished a map for a book that had no map: Mountains of Heaven: Travels in the Tian Shan, 1913. This version of the Charles Howard-Bury’s journals from his travels in what are today eastern Kazakhstan and the adjacent region of China, was published in 1990 and although it’s out of print, it’s generally available in the used book market. What I set out to do here was to resolve all the geographic references in the text. That is, you’re reading along, and he mentions the Yulduz plains or the village of Karachekinskaia, and you don’t know where that is. The various maps, atlases and website you can check don’t have it. So the book needs a supporting map. Pretty simple. But it evolved into something else. Initially I planned a 24″x24″ sheet of paper, a size typical of folded maps that used to be glued inside the back covers of books. It would contain three maps. There would be a 1:1 million map detailing the central portion of his journey, the area where he spends the most time and mentions the most local details. There would be a 1:3 million map showing how he got from Semipalatinsk to Jarkent, the ten-day journey along Russian post roads for whose specific route he gives intriguingly few clues. Last, there would be a map at 1:7 million showing his exit route from Central Asia, from Jarkent to Tashkent, and then on by rail to the Caspian Sea. Then things happened which illustrate some general hazards about mapping for old books. The first map became the main project, and eventually pushed both other maps off the sheet. It’s what you see above. There were simply too many details to squeeze it in at a smaller scale onto part of the sheet. I let go of the idea that all the mapping one would need could fit into 24″x24″. I began building a hillshade of the area in Blender, and figured out an hypsographic colouring scheme inspired by an old Soviet topographic map of the area (К-44-Б): low elevations are white, and then rise through oranges and brown to white summits. At the same time, as I tried to figure out just where Howard-Bury had gone, I found myself buried in old maps, wikipedia articles, and all sorts of other documents such as you get when you search on obscure terms like “Kuitun River.” I was reading maps in Russian and putting German websites through Google Translate. With each Aha! answer to a question, I felt more convinced that these puzzles — for the map had come to represent a series of puzzles — would make good stories. 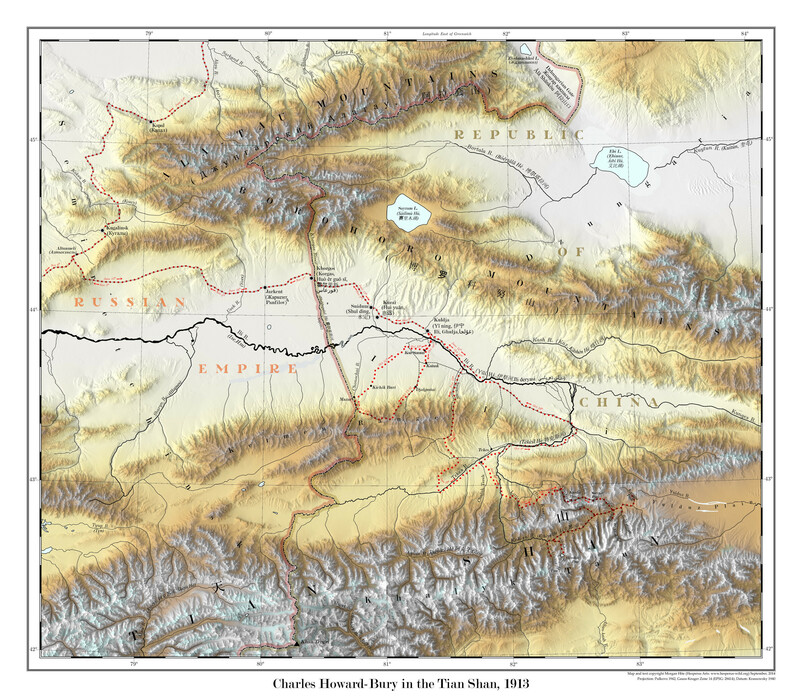 The sections in the bottom half cover the reason for the map, the plethora of alternate place names in Central Asia, a glossary of obscure terms Howard-Bury uses, an explanation of the Soviet topographic mapping system, some Turkic geographical equivalents, and a list of references. It is, in short, a brief tour of all the places I had to go to produce the map. I’ll do another post here to present an example of one of the interesting puzzles: where was Lepzinsk?